All natural skin care products made with products of the hive. Here you will find handcrafted skin care products as well as all natural facial skin care products. We are constantly working in our honey office to bring the highest quality products to you. 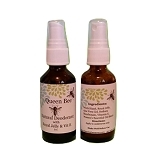 We use all natural essential oils in our products. We never add synthetics, fillers or harmful ingredients.